NEXT | How do you feel about needing Zidormi to change a zone's timeline? As World of Warcraft‘s patch 8.1.5 draws closer to live, we are getting more and more quality of life announcements. Hunters got an exciting note off the PTR courtesy of WOWPetopia’s Twitter. There appears to be qualifiers to this — the word “some” is in the sentence, and also “original apostrophes and spaces” are retained. My sense is that tamed rares in Kul Tiras and Zandalar will be allowed to keep their original names. This is good for the unique names on Zandalar — Horde areas seemed to get quite a few unique names containing spaces and apostrophes, like Ak’tar in the screenshot. Alliance areas got mostly just unique names, but even those can have issues. I would love to see this extended across all rare pets. 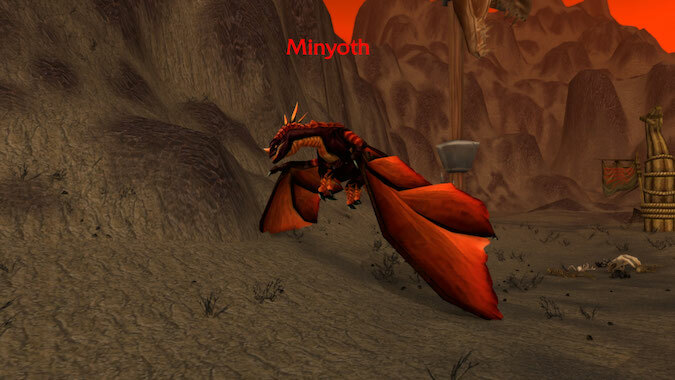 As I was flying around collecting coins from Elders for the Lunar Festival, I flew over to Burning Steppes. I have long wanted Sunwing but every time I’ve been over there it’s not been up, or someone’s taming it, or I get there right as someone kills it. Rares have rare loot sometimes and that attracts people who want to kill it. I don’t begrudge them that, but as a result I’d kind of given up on ever seeing that pet. As I rounded the hill west of Flamestar Post, there it was! I was so surprised, I couldn’t find my Tame Pet button at first. However, now I can’t name it “Sunwing” because that name is reserved. I get the idea that some names “belong” to some things. But if you’re out and about and you tame a rare, others might want to know what that rare is. I have a few in my stable I wouldn’t be able to tell you the real names of, just because I’ve had them so long. Being allowed to keep the rare’s name will help another Hunter seek out the really cool pets they see. And really, a lot of work was put into initially naming these pets — I think it’s a badge of honor that we hunters want to keep that name. Thanks Blizzard for this. 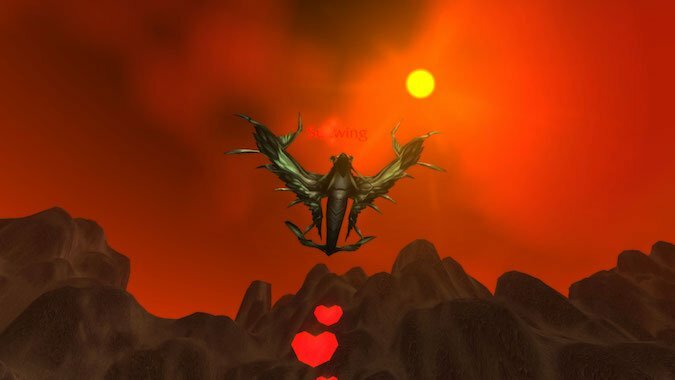 While I’m on the subject of Hunter pets and patch 8.1.5, our friends over at Wowhead datamined the new Allied Race Hunter starter pets. Zandalari Hunters will come with a Slate Direhorn. It appears they will be able to tame dinosaurs off the bat, without needing the Ancient Tome of Dinomancy. Kul Tiran Hunters have a unique Peregrine Falcon skin as their starter pet. I’m generally not a fan of birds — although I have three — because of the constant flapping. I would like them to perch on occasion. I am liking the falcon skin for Kul Tiran Hunters, though. It will probably be just a matter of time before all these direhorn and falcon skins are tameable. Finally — speaking of incessant flapping — how soon™ before we can tame these?